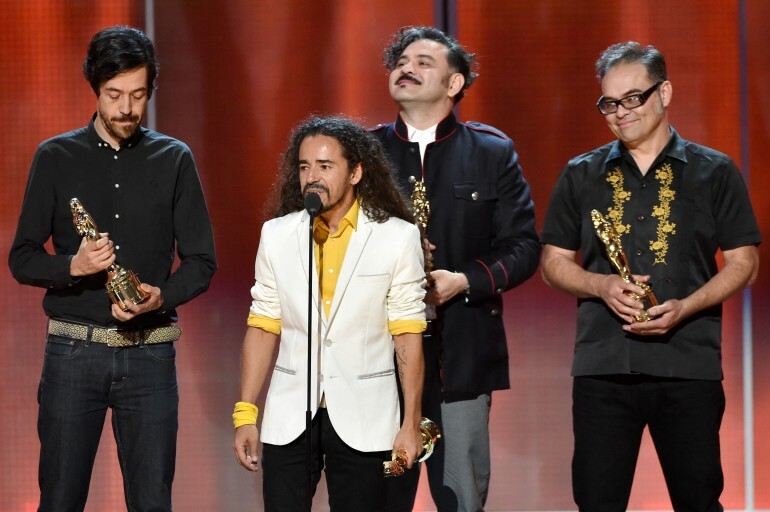 Legendary Mexican rock band Café Tacvba will be honored with the 2015 ‘La Musa Icon Award’ during the Latin Songwriters Hall of Fame 3rd Annual induction Gala, La Musa Awards to be held this October 15 in Miami Beach presented by WorldArts. The rockers will also be performing during this star studded gala event. Their last album, "El Objecto Antes Llamado Disco" was nominated for a Latin Grammy and was named by iTunes as the best Latin Album of 2012, The notable, worldwide music app describe the album as "a masterpiece with 45 minutes of pure musical ecstasy." This album was also included in the lists of the Best Albums of 2012 by NPR (National Public Radio) and LA Times. Band members Rubén Albarrán (lead vocals and rhythm guitar), Emmanuel del Real (keyboards and vocals), Joselo Rangel (guitar) and Quique Rangel (bass) are known for combining several genres of music within one song; such as rock, hip hop, electronica and folk music. With a musical career spanning over 25 years, Café Tacvba is considered one of the most important and influential rock bands not only in the Hispanic American community but also worldwide. Among their award accolades include a Grammy, a Latin Grammy and also the MTV Legend Award presented to them by Steven Patrick Morrissey. Newsweek hailed the band by stating “Mexico City’s Café Tacvba breathes new life into rock music, reaffirming faith in form while pushing it forward more aggressively and artfully then anyone since the Beatles“. The band recently celebrated the 20th anniversary of their album 'Re', which became one of the albums that defined Latin American rock and was named by Rolling Stone magazine as the "Greatest Latin Rock Album of All Time." During their prolific career, Café Tacvba has made a few films: "Seguir Siendo", directed by Ernesto Contreras, was launched in 2010 and covers the experiences of the band on tour through countries like Japan, the United States, Argentina as well as Mexico. The second cinematographic piece is named after their latest album, "El Objecto Antes Llamado Disco", a documentary filmed during the recording of this album. The unique feature of this movie is based on how it was filmed – in public – and in cities such as Buenos Aires, Santiago, Mexico City and Los Angeles; showing the most intimate part of the production process from the band, working alongside producer Gustavo Santaolalla who is being inducted this year into the Latin Songwriters Hall of Fame during LA MUSA 2015 awards. Quincy Jones, Rita Moreno, Gloria Estefan, Dionne Warwick, Paul Williams, Alejandra Guzman, Beto Cuevas, Cristian de la Fuente, Omar Alfanno, Lena Burke, Beatriz Luengo, Fantine, Yotuel, as well as exciting new artists Isabela Moner and Anthony De La Torre will be on stage at this year's Latin Songwriters Hall Of Fame 2015 La Musa Awards Induction Ceremony Directed by Richard Jay-Alexander and Conducted by Maestro Eduardo Marturet of the Miami Symphony Orchestra.